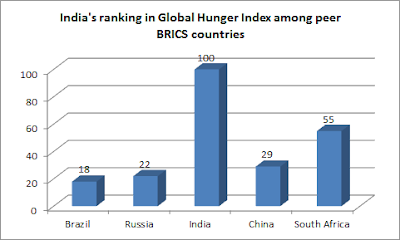 India has slipped in Global Hunger Index (GHI) by three points ranks – from 97th position to 100th among the 119 countries surveyed. Worked out by Washington-based International Food Policy Research Institute (IFPRI), what should be of particular concern for the country’s policy makers is, it ranks worse among its competing countries. Thus, among the BRICS countries, Brazil ranks 18th, Russia 22nd, China 29th and South Africa 55th. 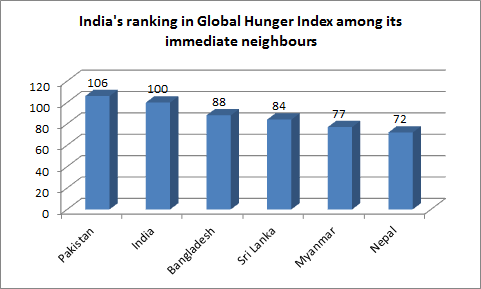 Even among immediate neighbours, while Pakistan lags behind India with a 106th ranking, the other important neighbours rank much better than India -- Bangladesh 88th, Sri Lanka 84th, Myanmar 77th, Nepal 72nd. household access to improved sanitation facilities -- a likely factor in child health and nutrition-- which stood at 48.4 percent as of 2016. India’s poor score, a slip by three ranks, has come about despite the fact the proportion of undernourished in the population in 1991-93 was 21.7%, and has been steadily going down – in 1999-2001 it was 17.2%, in 2007-09 it was 17.2%, and in 2014-16 it is 14.5. Among other three parameters used for identifying GHI, the report finds that in the prevalence of stunting in children under five years, there is a sharp decline in India from 1990-94, which it was 61.9%, to 38.4% in 2012-16. Even in the under-five mortality rate, there is a decline from 11.9% in 1992 to 4.8% in 2015. However, as for the prevalence of wasting in children under five years, there is, however, no improvement. In fact, the percentage of wasting children has gone up from 20.0% in 1990-94 to 21.0% in 2012-16.